A man arrested over the death of a vicar in South Gloucestershire is being questioned over the murder of a pensioner in Worcestershire. Betty Yates, 77, was found stabbed at her cottage near Bewdley last month. 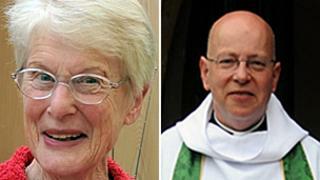 The Reverend John Suddards, 59, was found at his vicarage at St Mary's Church, Thornbury, on Tuesday. Stephen Farrow, 47, was arrested in Folkestone, Kent, earlier over the killing of Mr Suddards. He was later arrested over Mrs Yates's death. A West Mercia Police statement said: "A 47-year-old man was arrested in Kent on behalf of West Mercia Police, although he is currently being transferred into the custody of Avon and Somerset Police." Police had launched a nationwide appeal for Mr Farrow on Saturday. He was arrested in Folkestone by Kent Police at about 04:20 GMT on Sunday by officers acting on a tip-off from the public. West Mercia Police said they had "formally linked" the two murders. Det Chief Insp Neil Jamieson said: "We would like to thank Avon and Somerset Police for their help in our investigation. "We have been working with them to examine similarities between the deaths of Betty Yates and the Reverend John Suddards." Mrs Yates, a retired teacher, was found stabbed to death at the foot of the stairs at her home on the banks of the River Severn on 4 January. The 77-year-old had also been beaten with her walking stick. A man was arrested on 2 February and questioned by police investigating her death but he was later released on bail. Mr Suddards was found stabbed to death at his home in Castle Street. Builders found his body when they arrived for a planned job. They had been given a key by a caretaker. A post-mortem examination revealed he had died from "multiple stab wounds". Police arrested a 43-year-old man but on Saturday he was released without charge. Image caption The two murders have now been "formally linked"
The Venerable Geoffrey Sidaway, Archdeacon of Gloucester, urged the clergy to keep their doors open to "people who are distressed and angry" in the wake of Mr Suddards' murder. Speaking after taking the Sunday morning service at St Mary's Church, he said: "By the nature of the position, clergy are often dealing with people who are distressed and angry, and that can put us in very vulnerable situations. "The door must stay open - that is the whole point of the job. We need to be a church with an open door which is there to welcome and to help everyone." A former barrister, Mr Suddards joined the clergy 22 years ago after a serious car crash. He moved to the Thornbury parish six months ago, having served at St Nicolas Church in Witham, Essex, for 10 years and before that at Great Yeldham parish, 20 miles away in Essex.